Camille’s skin tells the story of her troubled past. Riddled with words that she carved into her skin, they tell the story of a girl trying to get through the pain of her teenage years in the only way she knew how. After a stay in the hospital, Camille became a reporter for a paper in Chicago. When a story about a child murderer calls her back to her home in Wind Gap, she doesn’t know how she will be able to face going back there. Wind Gap houses her past, her dead sister, and her addiction to carving words into her skin using knives from the kitchen. Everywhere she turns, there is a memory; whether it be an old face or an old hangout. Nothing has changed. What has changed is the fact that there are innocent girls being murdered in their town, and nobody knows who is behind it. As Camille tries to get her story and figure out what is going on in Wind Gap, she has to face all of her old demons . . . and her new ones. Her mother is as shut off and disapproving as ever. Her sister tries to be the golden child, but has a wild side that ends up with a night of drinking and doing drugs with Camille. Being attracted to a cop and playing a game of cat and mouse trying to get information and a statement from him. Nothing is easy down in Wind Gap. There are too many secrets. This was a really deep and dark book. Between dealing with mental illnesses and murder, there was no room for any bright storyline, and that it what makes it stand out to me. 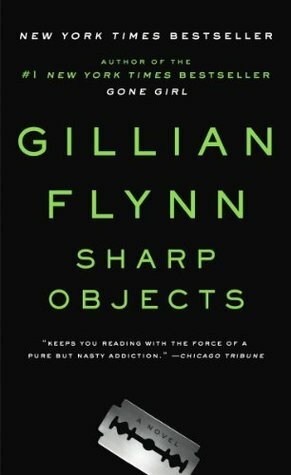 Gillian Flynn didn’t try to fluff up the story at all because these are very real problems that people face. It made the book very real and more interesting. The twist at the end was really interesting to me. I am not sure if figuring out who the murderer is was supposed to be a twist, or a confirmation of readers’ beliefs. I had it narrowed down to two people mid-way through the novel, and both of them ended up being caught and prosecuted for different crimes. So, it wasn’t really a twist to me, but it didn’t have to be. It was good to finally know what happened and who did it. That being said, the reveal of the murderer was really creepy. The explanation of where the teeth went and how the crimes went down was really disturbing. I was sort of disappointed with how Camille ended up at the end of the book. I was hoping that she would come out of Wind Gap stronger than ever and leave her past behind. She couldn’t do that and ended up reverting back to her old ways. I don’t necessarily always want books to have a happy ending, but I was really rooting for her. 5/5 Beautifully written. Really intriguing story. I haven’t been able to get the image of a crazy lady in all white taking a girl into the woods since I read that section in the book. That will probably be the thing that sticks with me the most. It gave me chills.